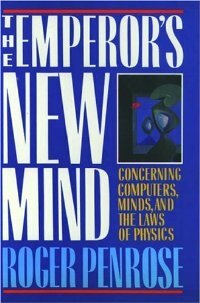 The Emperor's New Mind: Concerning Computers, Minds and The Laws of Physics is a 1989 book by mathematical physicist Sir Roger Penrose. Penrose argues that human consciousness is non-algorithmic, and thus is not capable of being modeled by a conventional Turing machine, which includes a digital computer. Penrose hypothesizes that quantum mechanics plays an essential role in the understanding of human consciousness. The collapse of the quantum wavefunction is seen as playing an important role in brain function. The majority of the book is spent reviewing, for the scientifically minded layreader, a plethora of interrelated subjects such as Newtonian physics, special and general relativity, the philosophy and limitations of mathematics, quantum physics, cosmology, and the nature of time. Penrose intermittently describes how each of these bears on his developing theme: that consciousness is not "algorithmic". Only the later portions of the book address the thesis directly. Penrose states that his ideas on the nature of consciousness are speculative, and his thesis is considered erroneous by experts in the fields of philosophy, computer science, and robotics. Following the publication of this book, Penrose began to collaborate with Stuart Hameroff on a biological analog to quantum computation involving microtubules, which became the foundation for his subsequent book, Shadows of the Mind: A Search for the Missing Science of Consciousness. The Emperor's New Mind attacks the claims of artificial intelligence using the physics of computing: Penrose notes that the present home of computing lies more in the tangible world of classical mechanics than in the imponderable realm of quantum mechanics. The modern computer is a deterministic system that for the most part simply executes algorithms. Penrose shows that, by reconfiguring the boundaries of a billiard table, one might make a computer in which the billiard balls act as message carriers and their interactions act as logical decisions. The billiard-ball computer was first designed some years ago by Edward Fredkin and Tommaso Toffoli of the Massachusetts Institute of Technology. Penrose won the Science Book Prize in 1990 for this book. ^ Landau, L. J. (1997). "Penrose's Philosophical Error". ISBN 3-540-76163-2. Archived from the original on 25 January 2016. ^ Various critical reactions to be found in Behavioral and Brain Sciences vol. 13 #4 (1990), 643–705, and vol. 16 #3 (1993), 611–622, e.g. M. Davis "How subtle is Godel’s theorem? More on Roger Penrose"
^ M. Davis (1995), "Is mathematical insight algorithmic", Behavioral and Brain Sciences, 13 (4), 659–60. ^ Royal Society Winton Prize for Science Books: Previous winners. The Royal Society. Retrieved 12 March 2013. This page was last edited on 20 August 2018, at 20:04 (UTC).